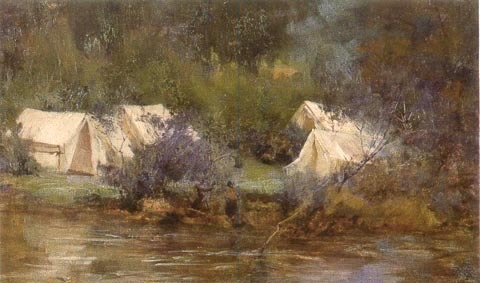 Professor Osborne, father of Audrey, in 'Audrey and Chickapick', permitted Girl Guides and Scouts to camp on his property in North Warrandyte, and this work is possibly a depiction of one of these camps set up on the banks of the Yarra River in that area. On the reverse of this work is a label from the Panama-Pacific Exposition of 1915, noting that this work was Catalogue no.3. The work was offered for sale through Sotheby's. Fine Australian Paintings, Fine Furniture and Decorative Arts. April 1991, Catalogue no.276.